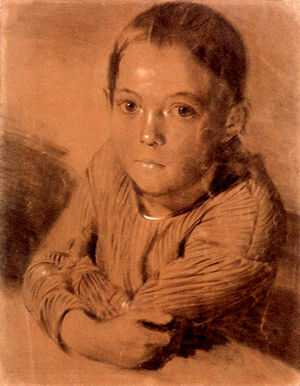 Drawing of a boy, Adolph von Menzel (1815-1905). 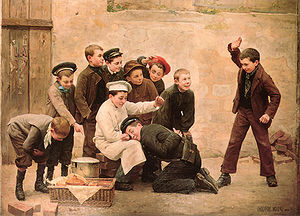 Painting by Paul Charles Chocarne-Moreau showing boys playing (1901). A boy is a male human child. When a boy grows up, he becomes a man. A boy is the son of his parents, the grandson of his grandparents and the nephew of his uncles and aunts. He is also the brother of his siblings. Boys who attend school are called schoolboys. In practically all cultures, boys are raised in some respects differently from girls. There are cultures where boys are treated less strictly than girls. They are (officially or unconsciously) expected to need greater liberties (boys will be boys). But there are also other cultures where girls enjoy greater liberties than boys. In most places, whenever children are spanked, boys are spanked harder than girls of the same age because parents and guardians assume that boys are less sensitive to punishment and pain. Spanking art that features boy spankees is called boy spanking art. Linked to the gender of the spanker, popular sub-categories are M/m and F/m.